I only met Olivia Robertson of the Fellowship of Isis once - at the FoI London gathering in 2011, but am very glad that I did. She was an amazing woman who was extremely influential in modern paganism and Goddess worship. Sadly, she died in November 2013, but her legacy and memory continues to inspire people. Pagan photographer Honey Salvadori emailed me to tell me about her new photozine, which she thought might be of interest to readers of A Bad Witch's Blog. 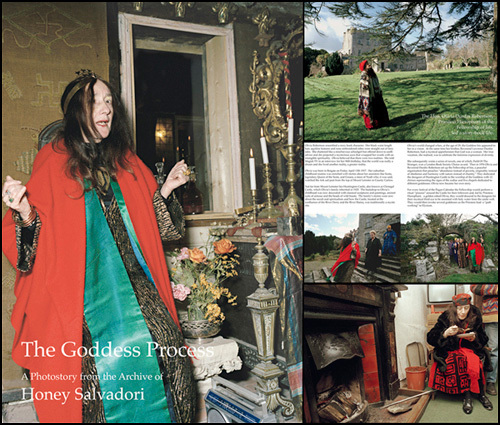 The photozine is called The Goddess Process and tells the story of Olivia Robertson, Priestess Hierophant of Clonegal Castle and co-founder of the Fellowship of Isis. Honey said: "The pictures were shot at the Spring Equinox of 1995 and document Olivia’s domestic life and ceremony. They have never previously been published. The zine is a 24-page colour book 15cm x 21cm and is available from my website and also from the shop at Huntington Castle (Clonegal Castle)."